This program has been developed by County Executive Mahoney and the County Legislature to help lower the prescription drug cost for County residents. 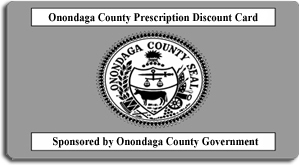 This program is free of charge to all Onondaga County residents through a partnership with ProAct, Inc., a Pharmacy Benefit Management Company. Discount cards are available at participating pharmacies, and online at: ProActRxDiscountCard. • Present the card at the pharmacy along with a new prescription or refill in order to receive savings. • Accepted at most participating county pharmacies.